1. "The Big Thaw Has Only Just Begun. Everywhere scientists gathered here there was talk of feedback loops of one sort or another. Melting permafrost is releasing methane gas, a far more potent greenhouse gas than carbon dioxide, to fuel more Arctic warming. 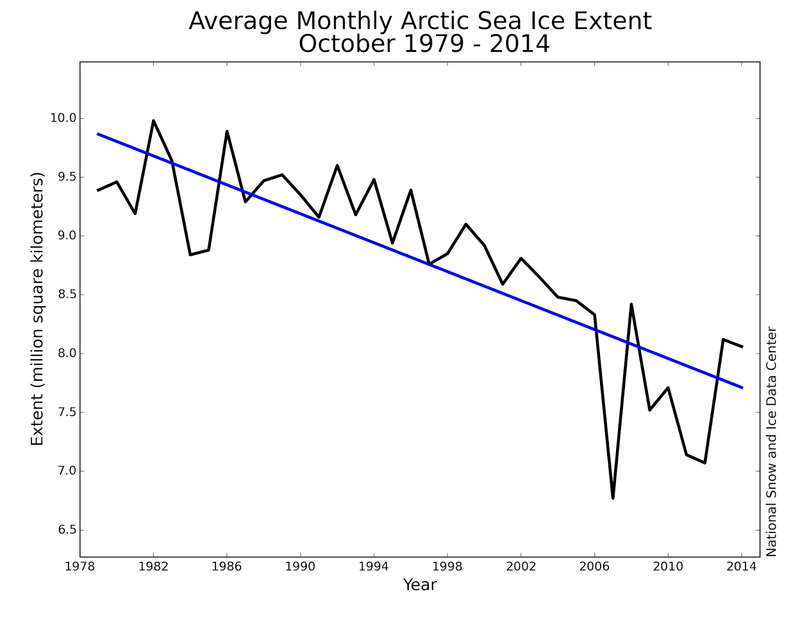 Melting sea ice is exposing more ocean to the sun to capture more solar radiation to fuel more Arctic warming. 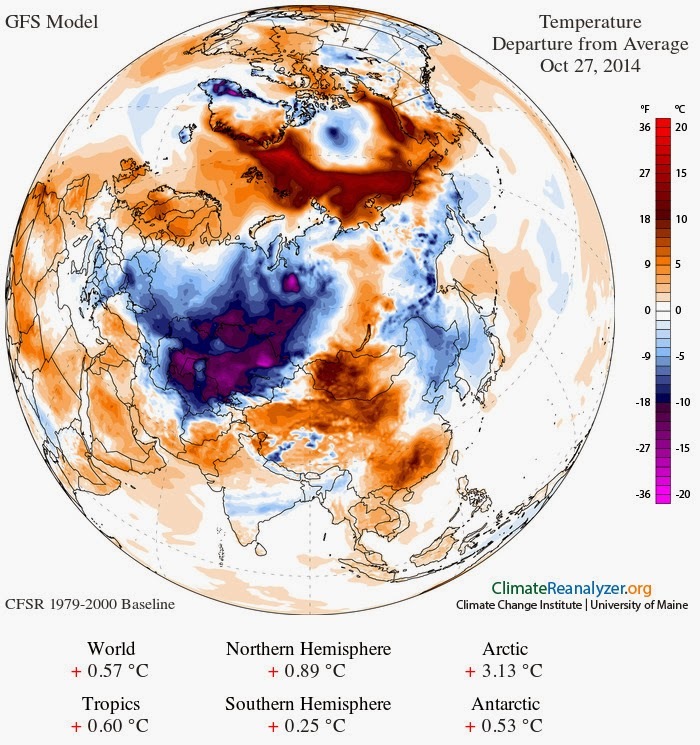 Warming Arctic water is evaporating to form more water vapor, yet another greenhouse gas, to fuel Arctic warming. All of this is now underway." 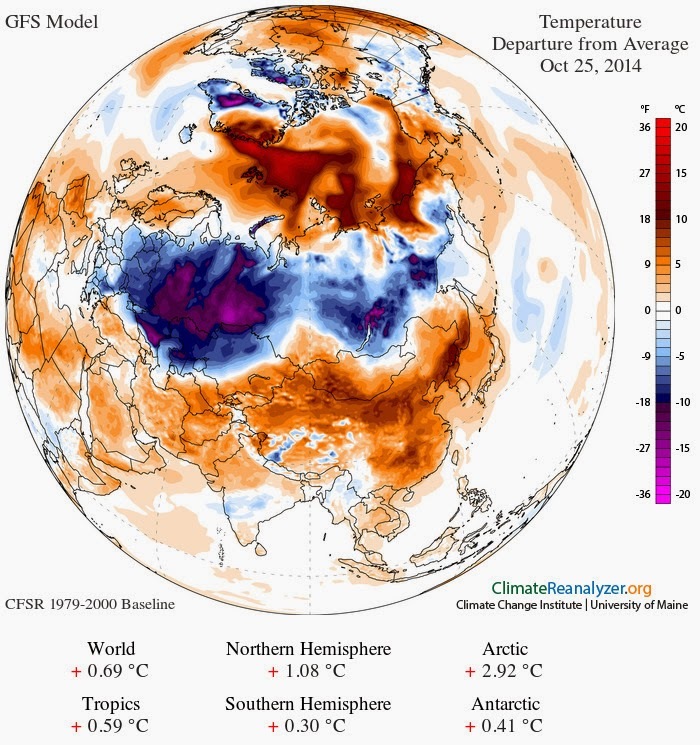 "No models here," Peter Wadhams, professor of applied mathematics and theoretical physics at the University of Cambridge in England, told the Arctic Circle Assembly on Sunday. "This is data." Wadhams has access to data not only on the extent of ice covering the Arctic, but on the thickness of that ice. The latter comes from submarines that have been beneath the ice collecting measurements every year since 1979. 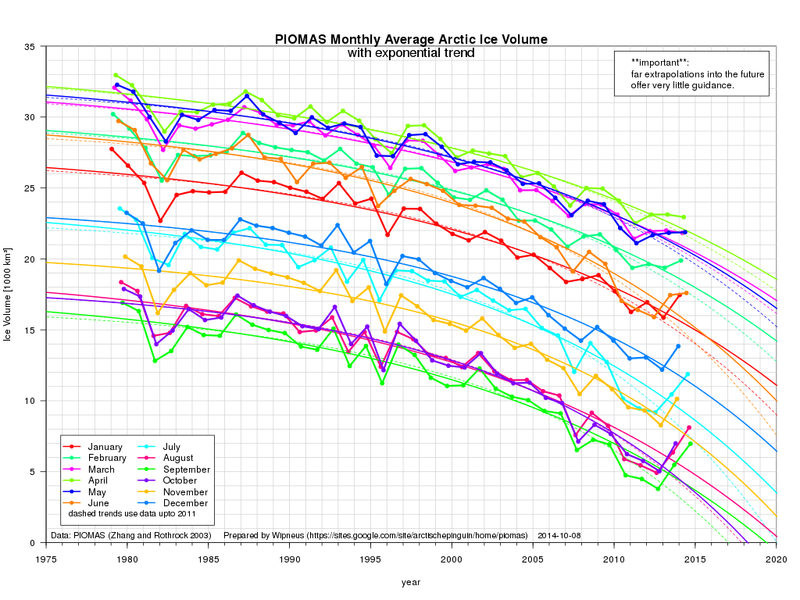 This data shows ice volume "is accelerating downward," Wadhams said. "There doesn't seem to be anything to stop it from going down to zero. 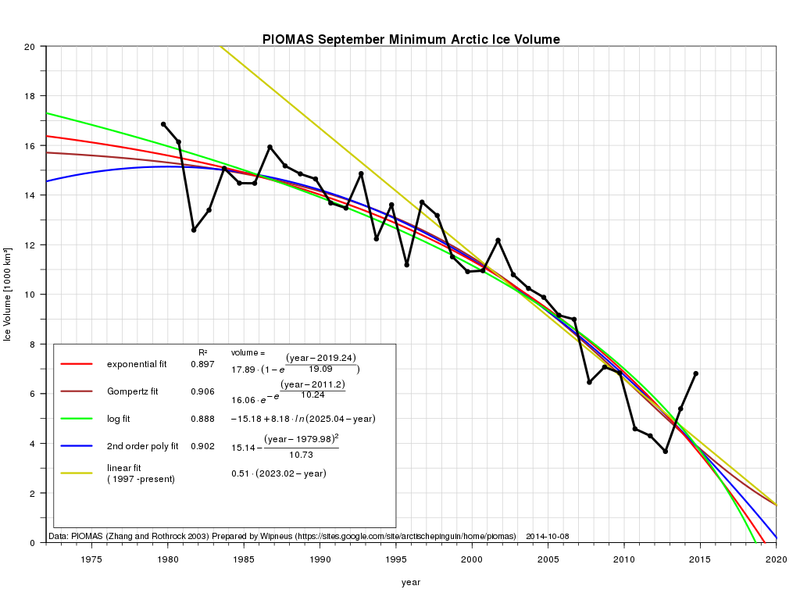 "By 2020, one would expect the summer sea ice to disappear. By summer, we mean September. ... (but) not many years after, the neighboring months would also become ice-free." Even with factoring in the bounce in September sea ice volume in Sept 2014, the statistical fits project an ice free September by 2019-2020. The problem is, we are not sure what impacts a sea ice free month will have on global climate, but if it does heat the Arctic Ocean in areas of sea bed methane, from the Kara to the ESS, then an acceleration of methane may not be far behind. Another session included Igor Semiletov, and dealt with Arctic methane issues. Unfortunately, we will have to wait to hear more on his comments. The NSIDC October Sea Ice report is out, and with October Arctic sea ice confirmed to be the sixth lowest on record - sustaining a 6.9% decline per decade since 1979. During January to October 2014, global mean methane, as reported by the EUMETSAT METOP IASI instrument, jumped significantly above last year's readings. Global mean methane year to date, as measured by IASI through October, 2014 climbed to 1807.80 ppb or 6.38 ppb above 2013. The primary causes for these increases seem to be accelerated permafrost melt, some additional methane release in Arctic Ocean, forest fires in peat areas/wetlands in Canada and Russia, rice production in South Asia, palm oil production in Southeast Asia and oil and natural gas production in Africa and the Middle East. There are some areas of low altitude concentrations or surface flares at this point that are consistently apparent in the METOP/IASI imagery, that reach levels above 1950 ppb. To help keep their identity's straight, I have combined the two names as METOP 1-B and 2-A to help delineate their data and imagery. The METOP 2-A imagery was first made available through the NASA OSPO in 2012, as far as I am aware. METOP 1-B imagery was first made available through the OSPO on April 5, 2014, while the METOP 2-A satellite imagery was unavailable. The methane readings of the METOP 1-B IASI instrument are generally 8-12 ppb higher than those of METOP 2-A. I am not sure why this is so, but presume that the METOP 1-B instrument readings may be more sensitive, or were originally calibrated differently. I hope someone who knows why will share with us. Both records are valuable in demonstrating trends in global mean methane. Comparing IASI Mean Methane vs WMO, WDCGG, ESRL, AGAGE, etc. 1. They have collected CO2 and CH4 measurements for many years, providing a longer term trend than satellite data/imagery. 2. They are generally always available to track those measurements through time for specific locations. 3. They are able to measure CO2 and CH4 in a variety of weather conditions, including cloudiness, and temperature variability which can interfere with the IASI data collection and imagery. However the WMO, ESRL, AGAGE and other agencies have some disadvantages. 1. The readings are for only a few specific locations, usually at the earth's surface. 2. Their readings do not extend into the atmosphere - in other words, methane concentrations any major distance above the surface are not measured. 3. Given the gaps in the network's global coverage, we have had to extrapolate what the global mean methane is based upon the stations in the network. Because areas not covered by the network may have lower methane readings, for example, then the global mean based upon the stations might be higher or lower than a more extensive network might report. The advantages of METOP IASI data/imagery is that it is truly global, and provides 100 potential layers of methane measurement across the entire glove. This larger statistical sampling provides a better basis for measuring global mean methane. One additonal advantage is that it is available almost real time, something not available from the ground based stations, except for CO2 from Mauna Loa as provided by Scripps and ESRL. However, this regrettably does not include daily CH4 readings. The drawback is the since areas with cloudiness, or gaps in satellite coverage happen daily, the IASI data and imagery is still a sampling. What will be closer to the ideal is if the the satelitte and earth based GHG measurement community comes to the point of merging the sources, then we will have a more robust and complete data set. The following is the average mean methane readings summary by 10 day period (dekadal) and monthly from January 1 to October 31, 2014, for the METOP 2-A satellite, in comparison to 2013 as available. What is being measured is the highest mean methane readings for each 12 hour period for each day's imagery and data as available. Given the nature of methane concentration, the altitude or millibar level for those highest means change throughout the year. Here is one image to illustrate what is being used from the OSPO. The highest global mean recorded by METOP 2-A IASI for a 12 hour period this year was 1829 ppb. January is the next to lowest methane concentration month, and the monthly mean was 1 ppb above January, 2013. February's mean was the lowest in 2014 as it was in 2013. The methane mean difference between the year's was negligible at .13 ppb. The March methane mean collection was incomplete due to a METOP satellite anomaly which took it off line for about a month, beginning March 27, 2014. What follows is calculated upon the available imagery. The year to date mean methane was 1794.04 ppb, which was .49 ppb above January to March, 2013. The METOP 2-A satellite was off-line for all of April, 2014 while its problem was analysed. No mean methane imagery was available through the OSPO. METOP IASI became available again on May 20, 2014. The following monthly mean reflects imagery readings for the last 10 days of the month. It results in a reading 2.68 ppb above May, 2013, which is likely too high given the data gap. June, 2014 sees a significant increase in methane over the prior year, of 3.84 ppb. The difference may be linked to heatwaves and increased fires in Siberia and Canada. However, global mean methane to date through June 30, was only 1796.05 and only .41 ppb higher than 2013. At this point it seemed that 2014 and 2013 would not exhibit much of an increase in mean methane, but the next three months changed that perspective. July witnessed an explosion of heat, drought and fire which accelerated methane release in July, 2014. The month average ended up 7.44 ppb above 2013. Global mean methane for January through July, 2014 was 1799.01 ppb an increase to 2.12 ppb above the 2013 mean. August witnessed the continued increase of fires, heat and drought which boosted global methane even more quickly. The global mean methane year to date through August was 1802.67 or 3.63 ppb above 2013. The major increase of global methane in September was troubling, but understandable as the same factors which impacted August's global mean methane continued. It is also possible that the warmer ocean water may have also influenced this increase in July through September. The last dekade of September had methane readings 15.45 ppb above 2013. The global mean methane year to date through September 2014 was 1805.87 or 5.39 ppb above 2013, YTD. This past month has witnessed continued elevated global mean methane due to global heat and increased methane in the northern hemisphere. It is clear that this increase may sustain through winter as darkness and temperatures fall in the northern hemisphere. Global mean methane year to date through October, 2014 climbed to 1807.80 ppb or 6.38 ppb above 2013. What the rest of this year brings remains to be seen, but one thing is clear - methane continues its climb with serious implications for global warming. Further reports will be created on a monthly basis. Methane spikes like the 2666 ppb recorded on October 26, 2014 by METOP 2-A during its 0-12 hr orbits, are exciting and create anxiety ("dragon's breath"), but in reality - they are transitory. In other words these spikes do not last, given wind changes, temperature variation and air mass and frontal boundary movement. While some claim the spike occurred in the Laptev or ESS, we do not have location data from the image to confirm that - it is a presumption. If those making the claims had the actual location data to support the assumption it will be helpful. Even if the spike is located over the Laptev/ESS, the 586 mb layer with the spike is not on the surface, but approximately 14,400 feet or 4,400 meters above the surface in a constantly moving airmass. A review of the earlier Methane Tracker imagery through time clearly illustrates that fact. To illustrate the transitory nature of the spike, here are four days (October 25-28, 2014) of the METOP 2-A IASI imagery for 586 mb. Note the highest range PPB reading variation for this altitude (in the "Range" section of each image) to illustrate the changes in concentration - given the dynamics discussed above. Here is the 415 ppb "spike" image from October 25 pm to October 26 am, as displayed elsewhere - without context. Note the swirl of circulation over Siberia, which would potentially concentrate CH4 for this spike reading. Note the following 12 hours experience a 317 ppb drop. Here are the October 27, 2014 images. The highest CH4 readings at 586 mb are still in the 2300's ppb. Here are the October 28, 2014 images, and note that the highest ppb are back in the 2200's. If one collects these images on a daily basis, you will see ongoing daily, dekadal and monthly variation and spikes at any mb level in the IASI readings. What is far more meaningful - and concerning - are the changes in mean methane readings. In other words, the mean or average annual increase and variance of this year over 2013 and prior years on a dekadal, monthly and annual basis. The global mean methane measure in each of the images above provides a better understanding of global methane concentration change - as collected through time. The post that compares global mean methane readings for 2014 to 2013 to October 31st follows.